The aunts of a 23-year-old man who was rescued at sea have filed a lawsuit accusing him of killing his mother — their sister — and his grandfather in order to collect millions of the real estate mogul's inheritance. 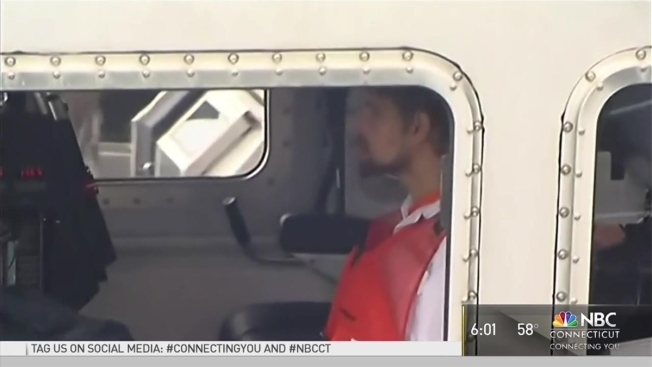 The lawsuit calls Nathan Carman, a native of Middletown, Connecticut, the prime suspect in his mother's presumed death after she went missing at sea during a fishing trip with her son last September. "The surviving sisters cannot stand idle while their father's killer, and perhaps their sister's killer also, profits from his actions. Since the law has a provision to stop this unjust inheritance, they have filed a so-called 'slayer action' in New Hampshire State Court to block Nathan from collecting money from his murdered grandfather's estate," a statement put out by the Chakalos' family attorney. "This is not about money, it is about justice." Carman's grandfather, real estate mogul John Chakalos, was fatally shot in 2013 and the lawsuit alleges that the 23-year-old is also the suspect in this unsolved case. The suit, which was filed in a New Hampshire probate court that oversees Chakalos' estate, asked the court "to declare that the murderer was Nathan Carman — John's grandson, their nephew — and that Nathan committed this heinous act out of malice and greed." An attorney unrelated to the case told NBC Connecticut that Chakalos left his daughters a $43 million estate after reviewing the 87-year-old's documents. Carman currently lives in Vernon, Vermont, and has not been charged in either case. Last September, Carman was rescued more than 100 miles off of Martha's Vineyard after more than a week on a life raft following a fishing trip disaster with his mother. Her body was never recovered and she is presumed dead. A search warrant executed on the Vernon, Vermont, home of Nathan Carman by the Windham County Sheriff’s Department at the request of South Kingstown, Rhode Island, in September, appears to show authorities there believe Carman is connected to his mother’s disappearance. In April, a Connecticut superior court judge denied Nathan Carman's motion to seal a nearly 3-year-old warrant connected to Chakalo's shooting death. Carman previously told the Associated Press that he had nothing to do with his grandfather's unsolved slaying and didn't harm his missing mother. For more on Nathan Carman, here is everything we know. "In 2013, four sisters suffered an unthinkable tragedy when their father John Chakalos was murdered in his own home. Less than three years later one of those sisters, Linda Carman, disappeared at sea under highly suspicious circumstances. The last person to see both of these family members alive was Nathan Carman, John's grandson and Linda's son. The details and evidence in the death of John and the disappearance of Linda all point to Nathan as the prime suspect. Yet he now stands to inherit millions of dollars from their estates. "The surviving sisters cannot stand idle while their father's killer, and perhaps their sister's killer also, profits from his actions. Since the law has a provision to stop this unjust inheritance, they have filed a so-called 'slayer action' in New Hampshire State Court to block Nathan from collecting money from his murdered grandfather's estate. "This is not about money, it is about justice. If the Chakalos sisters win this lawsuit and any money that would have gone to Nathan instead goes to the surviving sisters individually, they pledge to use those funds exclusively to pay for expenses incurred relating to the investigation into the death of their father and disappearance of their sister, and any remaining funds will go to charity. "The Chakalos sisters did not undertake this action lightly. This entire ordeal has been extraordinarily painful to the family and the public attention has made it even more difficult. However, they also know this is the right thing to do, and it is what their father and their sister would have wished."